New York , NY, 2018-Oct-16 — /Travel PR News/ — The Leading Hotels of the World, Ltd., a curated collection of more than 400 independent luxury hotels, is pleased to announce that more than 125 member hotels have been recognized in Condé Nast Traveler’s 31st annual 2018 Readers’ Choice Awards. Carefully selected by Condé Nast Traveler’s readership of discerning travelers, the awards honor top-rated travel experiences from across the globe. Leading Hotels’ continued presence within the prestigious awards is spotlighted with 13 member hotels earning the #1 rankings in their respective categories. Spanning the globe, these hotels include La Mamounia, La Réserve Paris Hotel and Spa, The Westbury, San Clemente Palace Kempinski, Hotel Metropole, Monte-Carlo, Baur au Lac, Capella Singapore, Hotel Cartesiano, Chablé Resort & Spa, Fairmont Hotel Vier Jahreszeiten, L’Horizon Resort & Spa, Carillon Miami Wellness Resort, and Faena Hotel Miami Beach. For a second consecutive year, a Leading Hotel was awarded the #1 spot on the esteemed “Best Hotels in the World” category. 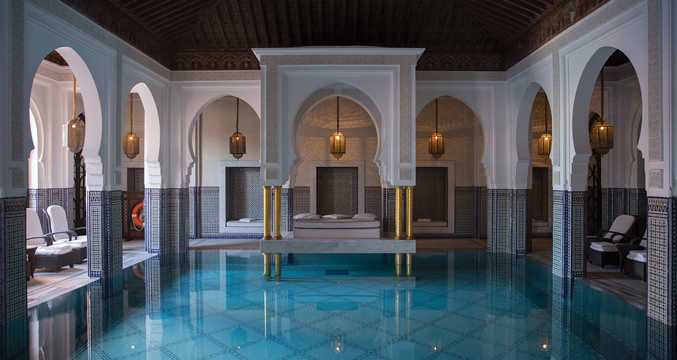 Receiving the 2018 title is La Mamounia, an iconic and beloved property located in the heart of the enchanting imperial city of Marrakech. Of the 50 hotels honored within the “Best Hotels in the World” category, Leading Hotels proudly boasts the most properties named to the list of any hospitality brand. The Condé Nast Traveler Readers’ Choice Awards are the longest-running and one of the most important recognition of excellence in the travel industry and are commonly known as “the best of the best of travel.” Nearly half a million readers submitted a recording-breaking number of responses rating their travel experiences to provide a full snapshot of where and how we travel today. The 2018 Readers’ Choice Awards are published exclusively on Condé Nast Traveler’s website and celebrated in the November issue on newsstands nationwide on October 16, 2018. To explore The Leading Hotels of the World members honored visit www.lhw.com/collections/cnt and the fully published list by Condé Nast Traveler online at www.cntraveler.com/rca. *Ranked #1 in respective category. This entry was posted in Hotels, Luxury, Resorts, Travel, Travel Awards, Travelers and tagged awards, Leading Hotels of the World, Ted Teng. Bookmark the permalink.